Cleaners storage cabinet with 3 adjustable shelves providing efficient storage for cleaning supplies, materials and equipment. 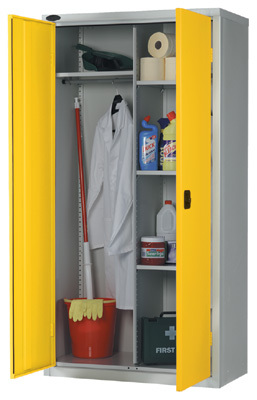 The cupboard includes a hanging rail to store overalls as well as enough space for buckets, mops and other cleaning items. A Unique Activecoat anti-bacterial coating protects against MRSA making this an ideal choice for schools, hospitals, and public buildings.